:: View topic - Butterfly's sculpted egg -- a suitable wedding present? Butterfly's sculpted egg -- a suitable wedding present? Posted: Wed Aug 10, 2005 10:40 pm Post subject: Butterfly's sculpted egg -- a suitable wedding present? 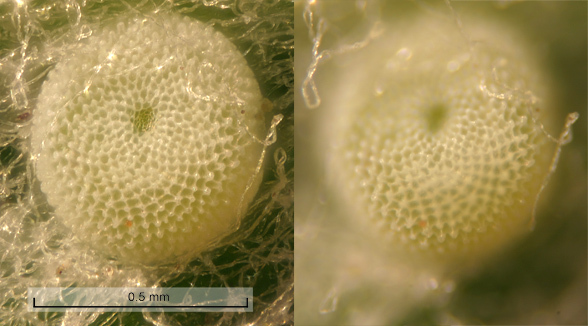 Thought you might enjoy this egg from a small Lupine Blue butterfly. Did Faberge get some inspiration at the microscope? Stacked image on the left, one representative frame on the right. Icaricia lupini egg, processed by Helicon Focus from a 59-frame stack. Shot with a 10X, 0.25 N.A. microscope objective on 240 mm tube to Canon Digital Rebel. and the online article "An Introduction to Extended Depth of Field Digital Photography". Using so many frames, you might think this image is just a poster child for stacking technology. But in fact I am fascinated by the image -- especially the stereo pair -- because I can instantly and effortlessly see structure that I was never able to see directly through any microscope. The time to generate the stereo pair was more than repaid by the pleasure I get from it. Great image Rik, the HF works really well. Never have seen a butterfly egg before or maybe have but did not know what it was at the time. Thanks for sharing, the image and the info Rik! Interesting image...and title. I like the little blue BFs, but this is the first I seen an egg of any BF and I have been looking. Fantastic magnification, the pattern on the egg is really interesting. With you hard work to produce images I have to reconsider my macrophotographing as "snapshots"
Thanks! Some might say that I am just a masochist and love beating my head against brick walls! I confess, it is a personal quirk that I tend to do a few things the best I possibly can. In this size range, these deep stacks produce a combination of sharpness and depth of field that competes with scanning electron microscopy (SEM). Surely, to set up and process a stack cannot be as much trouble or expense as to prepare a specimen for an SEM.